Investors faced a litany of doubts this year. Raging dysfunction in DC, a string of natural disasters, and even threat of nuclear war. But investors aren’t shaken. 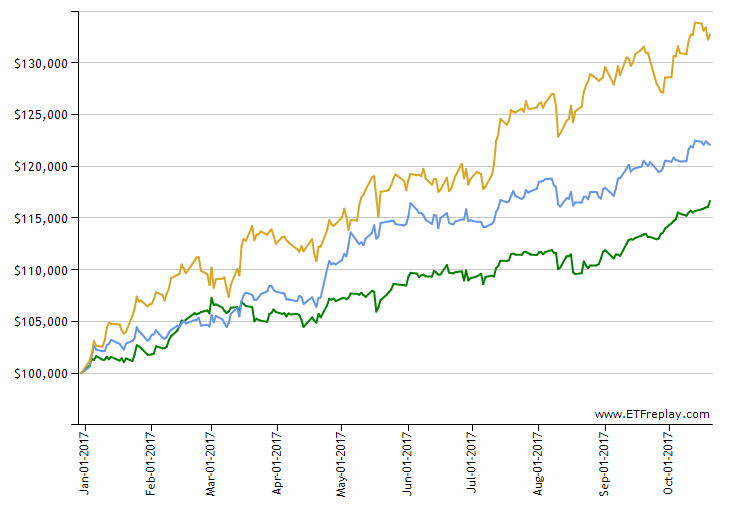 Year to date the S&P 500 is up 16%+, the EAFE 22%, and EM 32% (represented below by returns for SPY, EFA, and EEM respectively). The truth is the proverbial wall of worry never goes away. Headline risks, whether social or economic, don’t disappear but just reinvent themselves with different monikers. That’s not to say the markets won’t turn — because they will, but probably not for the reasons we see on the front page. Meanwhile, we’re on it and we can either freeze in fear or keep climbing. Whatever you do, just don’t look down. This blog is for informational purposes only. Nothing on this blog represents advice of any kind. Investing is inherently risky and involves the risk of potential loss.